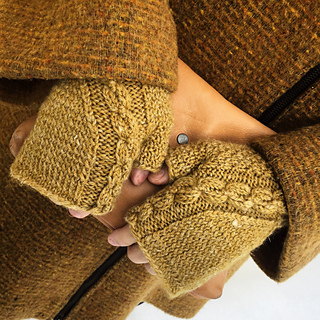 The Pompuloi fingerless mittens are magic looped top down. They are identical. 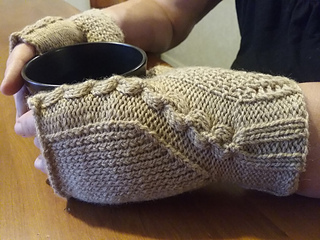 You can knit one mitten first and then the other one. Or you can magic loop them two-at-a-time with either one longer circular needle or two shorter circs. If you knit them two-at-a-time, then your yarn skein should be wound up into a center pull yarn ball or two separate yarn balls. First you knit the thumbs and leave them to rest. Then you knit the palms. 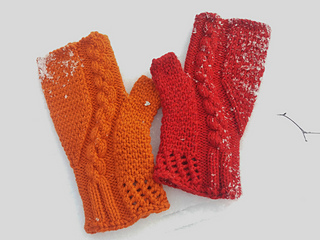 After that you join the thumb stitches together with the palm stitches and knit the thumb gussets with the needed decreases. 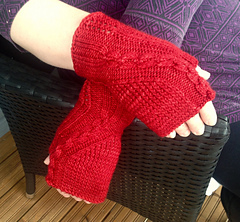 You continue knitting the wrists and finishing with the cuffs. One size fits most. Finished measurements after blocking: Palm circumference (below knuckles, above thumb): 17,5 cm (6,9 inches), Mitten length: 21 cm (8,3 inches). Note: You can alter the size by using bigger / smaller needles and by knitting with thinner / thicker yarn.